T-shirts can be great reminders of team experiences and memories of past vacations. But when the stitches loosen and that ballgame mustard stain just won't leave, how can these cotton momentos be saved? A shirt quilt is a great way to preserve T-shirt memories long after the fit has faded. To make a shirt quilt, the first thing you need to do is gather some shirts you are no longer wearing that you wish to preserve. Cut up the sides of the t-shirt all the way to the armpits. Cut around the sleeves to remove them. Cut the back of the t-shirt away from the front at the shoulders. Discard the back of the T-Shirt unless the design on the back will be included in the quilt. Interfacing will stabilize the stretchy shirt material to make the squares easier to cut and sew. Cut a piece of interfacing that is 14 inches square. Lay the T-shirt print-side down on an ironing board. Set the iron according to interfacing instructions (usually medium-high with no steam). Iron the 14-inch square of interfacing on the shirt so it is secured behind the print. Repeat for each shirt. Most T-shirt logos can be captured in a 12- by 12-inch square. To make cutting T-shirt pieces quick and easy, use a piece of cardboard or paper to make a 12-inch by 12-inch square pattern. Place the pattern over the T-shirt design, mark edges with chalk, and cut. Lay the 16 shirt squares out and decide where they will appear on the quilt in rows of four. It can help to make a quick sketch. Using a medium stitch size, sew a 2-inch by 12-inch strip of fabric to the bottom of the T-shirt squares that will be on the first three rows of the quilt. Use a half-inch seam allowance. Zigzag the seam allowance to prevent unraveling. Zigzag stitch seams and press flat. Lay T-shirt squares out as they will appear in the quilt. Use a medium-sized stitch and half-inch seam allowance to sew the top of the second T-shirt's square to the bottom of the fabric strip on the first T-shirt square. Repeat down the column until four T-shirts are sewn together. Press seams flat and trim fabric to create an even edge. Use a medium-sized stitch and half-inch seam allowance to sew a 2- by 53-inch strip of fabric along the long right edge of the first quilt column. Repeat for the second and third T-shirt square columns. Press seams flat. Sew the columns together using a medium-sized stitch and half-inch seam allowance. Stitch again, just behind the first stitch on the seam allowance. This is important because these long sections need to take a lot of stress. Zigzag the edge of the seam to prevent unraveling. Press the seams flat. Trim any excess fabric to make sure the edges of the quilt are even. With a medium-sized stitch and half-inch seam allowance, sew a 52- by 4-inch strip of fabric to the top and bottom of the quilt. Zig-zag stitch seam edge and press seams flat. Measure the quilt and cut a sheet of batting and backing fabric that is at least two inches larger than the quilt top. Lay the quilt top face-down, place batting layer over quilt top, and lay down the backing right-side up. Use small safety pins to pin all three layers together, placing pins in the corners of each T-shirt square. Use a long stitch to sew in the 'ditch' between the T-shirt squares and bordering fabric. Sew all the way down a middle column, then across a middle row. This will create a cross that will keep the fabric from shifting during stitching. Sew down each 'ditch' on each column, then across each row. Use a long stitch to sew all along the edge of the quilt, a half-inch from the edge. Use this guide to sew quilt binding to build quilt strips or stitch on pre-made binding. Remove all of the safety pins that held the quilt in place during stitching. 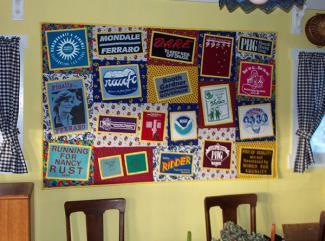 Consider wrapping the quilt in stitched-together T-shirt scraps and adding a ribbon to give away as a gift. 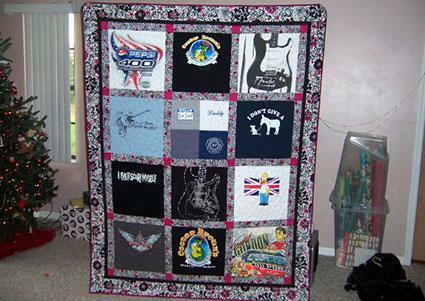 T-shirt quilts make great gifts for graduating teenagers to commemorate the band, sports, and theater seasons that they participated in throughout the years.